I have pretty much given my kids free-range access when it comes to crafting and creating. I always try to keep our craft supplies stocked full and keep an eye out for crafty materials at thrift shops and sales. I also started them very young with things like simple stitching, painting, coloring, drawing, etc. I suppose this comes a bit naturally for our family since my husband and I both enjoy working with our hands. He with wood and other building materials. I with yarn and thread and whatever else is floating my boat at that present moment. So it's always been my desire to encourage creativity in my children. I have done this by teaching them basic skills at an early age and then letting them run with their creative projects and pursuits when they get the itch to do so. So when Lily came to me yesterday and told me she wanted to make a homemade "Furby," I let her go at it. She took a few minutes to dig through our fabric bins and then started into her project. I have to admit that I thought she'd probably work at it for a while and then get distracted or tired and give up. But that little girl pushed through and had it finished in a few hours. And she did it completely independently. This is the first time she's done a sewing project all by herself. I was so proud of her and made sure that she knew that! And she was so excited with what she had made all by herself. After dinner, she asked me if we could make a stuffed owl together. So we spent a couple of hours making templates, cutting fabric, hand-stitching everything together, and voila, we had an owl by bedtime. She cuddled both of her handmade animals last night when she went to bed. I really love for my children to pursue artistic or handy projects. Just like I enjoyed Ian's adventures with bow-making, I really enjoyed watching Lily pour her energy and time into making her own handmade stuffies yesterday. So how do I personally do this? How do I encourage their creativity? 2. Guide them but encourage them to try to do things more independently as they become able. 3. When they make a mistake or something turns out different than what they had hoped, encourage them to adapt their plans to make the mistake into something workable and beautiful! Ian is a perfectionist. Just last week the kids were watercolor painting and he "messed" something up. He got very upset and wanted to give up. I very gently tried to encourage him to turn his mistake into part of the picture, to look at the mistake not as a mistake but as an opportunity to figure out how to adapt his idea. He reluctantly went forward, and ended up with a beautiful watercolor painting of a vase of flowers. 4. When they are able to do so, let them work independently, without interfering unless they ask for your help. Offering advice when it hasn't been asked for is a good way to stifle your child's creativity. It will make them second-guess their abilities and their ideas. Think of how you would feel if someone told you that they thought you should do something a particular way. I'm not talking about critical criticism here. I'm talking about you thinking that you know what looks best and then forcing your ideas upon your child. Trust me. I bite my tongue and hold back my opinion frequently. I guess the reason I want my kids to explore and use their creativity is because I know how good it feels to make something with my hands. There is such a sense of deep satisfaction in completing a handmade project. I want my children to be confident in their ability to create. I want my children to not be hesitant to seek out new creative endeavors. I want them to feel confident in their ability to learn and maybe even master new skills. And that is why we desire to foster their creative endeavors. 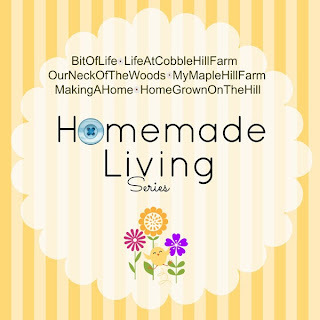 To see how other bloggers are living handmade, please go visit Staci at Life at Cobble Hill Farm and Daisy at Maple Hill 101. It's so great that you foster and encourage your kids' creativity like this! Lily's creations are so cute. I think it's awesome that you let her experiment and figure things out on her own. This is so precious Amber! I love her creation. I so want to encourage the creative side in my kids too, this hit home for me. Great post (as always). 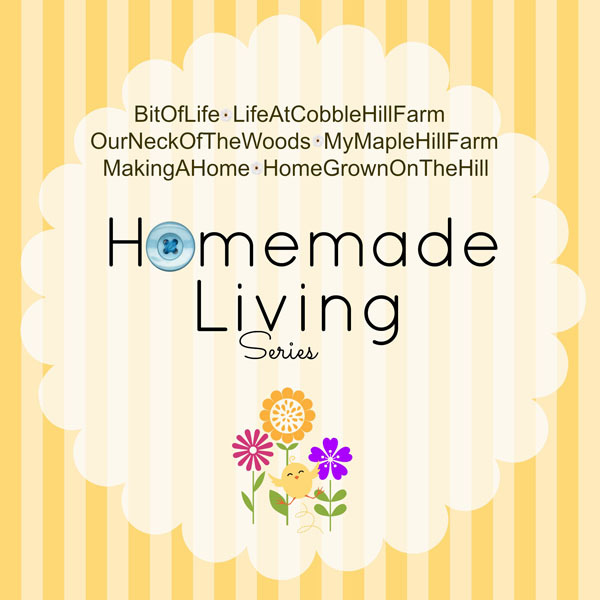 You're such a natural encourager of others on your blog :) I'm not kidding, I always feel better after leaving your blog. Oh, I love Lily's new toys. How great that she made the Furby all on her own! I really enjoyed reading all your ideas for encouraging creativity. What an awesome mom you are! Her creations are very, very precious. We did the same with our kids as they were growing up. We also let them cook with us. Those things have become a part of who they are today. They love to cook, and are very creative. Keep up the good work. thats awesome..She did a great job..